In April of 2015, I had the opportunity to have a two person show at Exposure Gallery in Sioux Falls. Working with Caitlin Pisha, we came up with a theme focused on our travels to Japan. I wanted to continue my exploration of the cyanotype process and this ended up being the perfect opportunity to combine two of my loves: alternative photographic processes and Japanese imagery. Zen View Cyanotype, mixed media. 17 in. x 37 in. Himeji Cyanotype, mixed media. 33 in. x 17 in. During a previous foray into cyanotype printing, I stumbled across the work of Betty Hahn. Her combination of photography and mixed media produced work that I found very compelling. (I think I was also drawn to her work because some of it used flowers for subject matter, which I am also drawn to.) I still haven’t found a balance of mediums that I’m happy with; the addition of color tends to flatten the image considerably. Fade Cyanotype, mixed media, silkscreen. 35 in. x 28 in. In the first prints of the series, there were large unexposed borders. The photos felt complete, but I still wanted to push the images further. 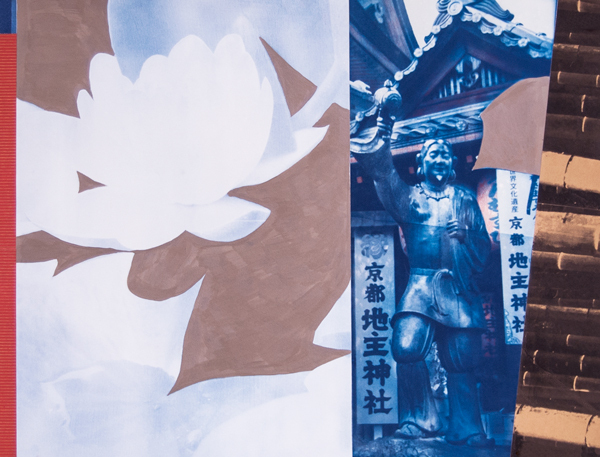 In an attempt to escape from the dead end that the bordered images seemed to be, I started to cut the images and juxtapose them with each other in an attempt to create something that felt true to my memories of Japan. Fade was the first piece that resulted from this remixing of imagery and the rest of the work flowed from there. First Bloom Cyanotype, mixed media. 33 in. x 17 in. This small body of work ended up being a nostalgia trip for me. Not only was it reliving a trip from almost a decade ago, but it was also reworking imagery that I’ve worked with repeatedly since then. And working with physical materials to create photographs was a welcome reminder of how many opportunities working by hand can present to an artist. Definitely a journey that I am willing to walk again and again. Echo Cyanotype. 56 in. x 24 in.